We drive through many traffic lights every day and rely on them to control multiple flows of traffic. While we trust traffic lights to keep vehicles and pedestrians moving in a safe manner, accidents at traffic light intersections are common and can result in severe injuries. According to the Illinois Department of Transportation (IDOT), accidents at intersections account for over 25 percent of severe injury and fatal crashes. In Rockford alone there were over one thousand accidents at traffic signal intersections in 2014. As a car accident attorney, I stand up for drivers injured in traffic light accidents. If you or a loved one have been injured in a traffic light crash, then compensation can help cover the cost of medical treatment, hospital visits, physical therapy, car repair bills, pain and suffering, and other expenses. Call us at (815) 289-3209 to discuss your case with a Rockford personal injury lawyer. Running a Red Light – The deadliest type of crash at an intersection happens when a negligent driver tries to speed through a red light and crashes into another vehicle in the intersection. Following Too Closely – Negligent drivers often speed and drive dangerously close to the car in front of them in hopes of passing the light before it turns red. This type of driving can result in rear-end accidents at intersections. Left Turn Accidents – The driver making a left turn at an intersection must make sure it is safe to proceed with the turn. If a driver making a left turn proceeds through the intersection when oncoming traffic is too close and causes a crash, then they will be responsible for the accident. When the light turns yellow, vehicles in the intersection must complete the left turn after oncoming traffic has come to a halt. However, if a driver runs a red light and crashes into someone making a left turn, then they will be at fault for the accident. Right Turn Accidents – Drivers making a right turn at a red light must make sure it is safe to complete the turn. Collisions often occur when drivers misjudge the speed or distance of other vehicles. Additionally, accidents occur when drivers making a right turn anticipate that other drivers are going to stop at the light but those drivers run the red light. If another driver runs a red light or otherwise crashes into you at or near a traffic light, you still need to prove fault to the insurance company so you can recover compensation for damages to your vehicle and reimbursement for medical expenses. Most of the time, these type of accidents give rise to a he-said-she-said dispute with each driver giving a different account of what happened. In that case, the insurance company will likely deny the claim to try and avoid paying. 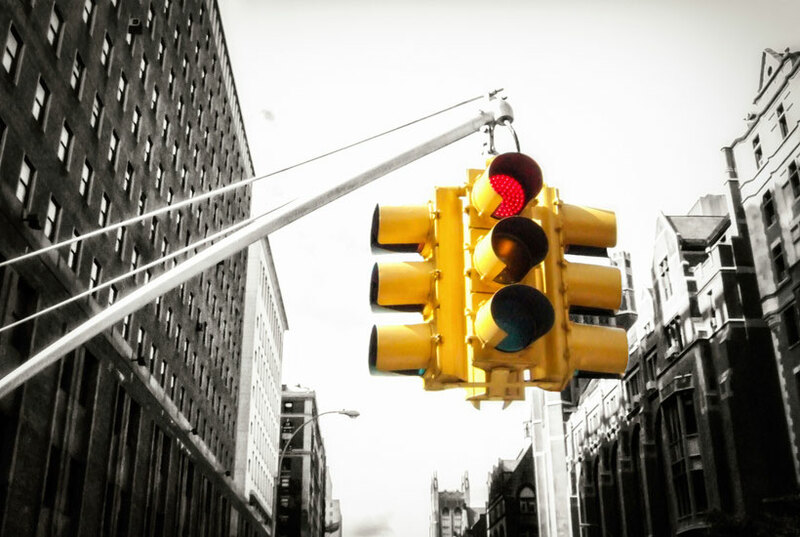 Gathering evidence is essential to winning your traffic light accident claim. Favorable evidence can include photographs, witness testimony, police statements, and video surveillance from nearby storefronts with street view cameras. If you or a loved one have suffered injuries at a traffic light intersection due to someone else’s reckless or negligent driving, our Rockford personal injury law firm can help you prove the other driver was at fault and help you receive compensation for your injuries. Call the Law Office of Adrian Murati at (815) 289-3209 to speak with a personal injury attorney about your case. We handle auto accident cases on a contingency basis so we only get paid if you get paid.